At BCA, our faculty and staff lead and teach children through Christian principles. Students have the opportunity to experience the love of God and receive grace through the knowledge and belief in Our Lord and Savior Jesus. Each day begins with a student-led prayer following morning announcements. Students in each grade will have a daily Bible class and will be taught age-appropriate lessons. Each Wednesday, faculty, staff and students worship together at our chapel service. Services are held at Good Shepherd Lutheran Church located next to the school (Chapel will be held in the school gymnasium in the case of inclement weather.) Students will have the opportunity to hear a variety of speakers and pastors during chapel throughout the school year. School-wide service projects are an integral part of student life at BCA. Each Wednesday, children are encouraged to bring in offering to support a special cause or are asked to donate items for various collections we hold throughout the year. Salvation Army, the Community Kitchen and Northside Neighborhood are among the many charities we support. While it is important to teach children to practice giving, we also challenge students to follow and improve upon their Christian character traits. Being able to practice patience, self-control, respect, honesty, forgiveness, kindness and show the love of Christ are among the traits that we hope to build in our students. Pastor Joshua Woodrow of Bridge City Community Church often leads chapel on Wednesdays. 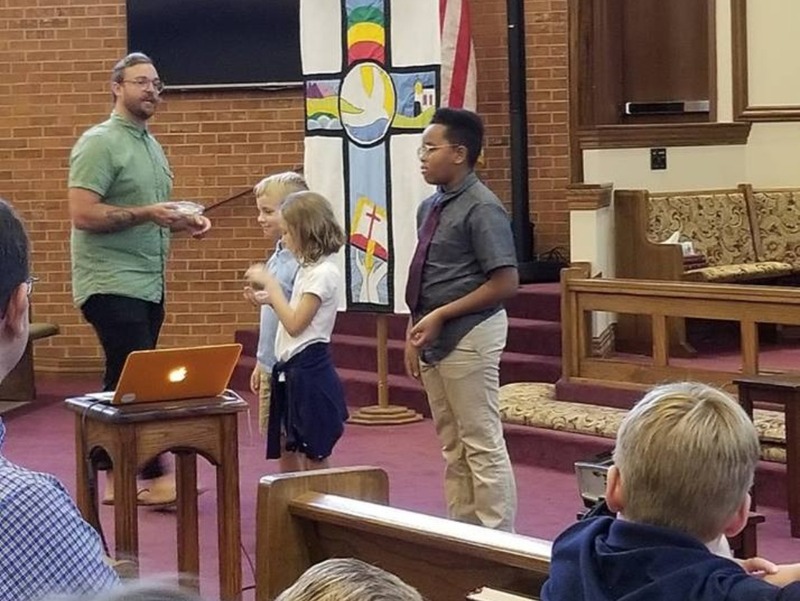 In a recent chapel, he solicited a few student volunteers to help. He mentioned candy would be involved, so everybody wanted to volunteer.